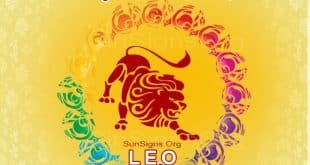 Leo Horoscope 2019 – Get Free Predictions! 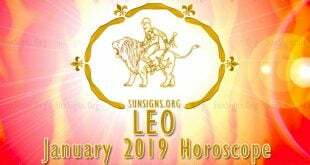 2019 forecasts for Leo foretell that while you will be working a lot this year, your free time will be full of fun. Leos are natural leaders and by nature, are very courageous and daring. Your relationships will include a lot of socializing and entertainment. 2019 Leo November horoscope foretells that you will travel extensively with your family. The Leo July 2019 love astrology reveals that your family affairs will be turbulent this month. Education will be a part of your focus this month. The Leo August 2019 horoscope predictions show that this month will see you traveling due to work. Your career will exceedingly take a new root due to the transformations taking place at your workplace. This is a delightful month for your family in most ways since the stars are in an accommodating mood. Your health will be good but only for some few hitches here and there. Leo horoscope April 2019 predictions reveal that your financial status at this juncture will spearhead your expectations. On the basis of 2019 forecast for Leo, blessings will come your way this month. Monthly Horoscope for Leo 2019 shows that career development will be easy for some of you. According to the Leo 2019 January horoscope, this month you will only be involved in leisure travels. Based on the Rashifal 2019 Simha finances will be great for you this year. 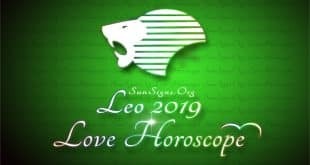 The 2019 Leo love predictions reveal that this is the year you need to explore love to the fullest. These two fire signs have excellent love compatibility with each other, as the Leo woman is bold and adventurous and the Sagittarius man is constantly on the go. The Leo woman is strong and independent. One might think the union of the Aries woman and Leo man would burn right down to the ground. 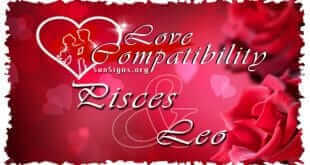 In the Pisces and Leo love compatibility both will enjoy the new view on life they can show each other. The Aquarius and Leo love compatibility in a romantic relationship will cause people to take notice. The Capricorn and Leo compatibility will be encouraging. The two zodiac signs of Sagittarius and Leo in love will be bright and electric. The Scorpio and Leo compatibility in a romantic relationship will be exciting and passionate together. The Libra and Leo love compatibility in a romantic relationship will be typically agreeable with each other. The two zodiac signs of Virgo and Leo in love might feel like they have nothing to benefit each other. In a Leo Aries love compatibility they are both very devoted to each other. A romantic relationship can be a good connection for Leo and Taurus compatibility. Leo and Gemini relationship will have a fun vibe around it. Both Leo and Cancer in love will need to have loyalty and attention for each other. 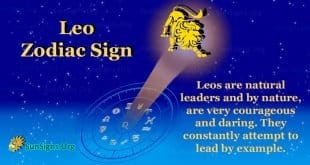 In the Leo-Leo relationships, they will also see themselves as a team. In the Leo and Virgo compatibility, they will both need to put in a lot of effort into their relationship if they are to make it work. The Leo and Libra relationship is that of a harmonious couple. The Leo and Scorpio love compatibility have many opposite traits that work well. It is bound to be exciting when Leo and Sagittarius in love get together to form a romantic relationship. The Leo dating a Capricorn are likely to go on many romantic dates. The Leo Aquarius in love just want to be with someone who can excite them. When it comes to Leo and Pisces compatibility, there will be a sense of mutual attraction at first, but this needs to be nurtured. The Simha Rashi people are quite sociable and with their friends. In a Cancer and Leo relationship, both are able to have trust and mutual dedication. A Gemini and Leo love compatibility together in a romantic relationship can be an exciting adventure. Taurus and Leo love compatibility is amazing together. Aries and Leo love compatibility is one that is very interesting. Leos make excellent lovers and pamper their partners to no end. Do Leo men make good romantic partners or do they just believe in flirting? While dating a Leos, they need lots of attention and praise. In matters of love, Leo male lover is loving and extremely passionate. The Leo Woman in love is loyal to her partner when she finds her true soul mate. Leo fathers are in general benevolent, satisfied and majestic in nature. A Leo mother by nature is adorable and warm in spite of presenting a stern and harsh appearance.